Recent months have been plagued by a series of terrorist attacks in several Western states. Each of these incidents were followed by a general outcry and outpouring of empathy from Western citizens around the globe. They also spurred Western leaders to publicly reaffirm that their populations will not be intimidated by terrorists and that core Western values of civil liberties will not bend under the pressure. Yet, terrorist attacks seem to drive legislators to table new bills tightening internal security at the expense of their citizens’ freedom and privacy. Following the Charlie Hebdo attacks, UK Prime Minister David Cameron proposed new legislation that would give authorities the legal power to break into and monitor encrypted communications (such as the popular Snapchat app) of terrorist suspects. ‘‘In extremis, it has been possible to read someone’s letter, to listen to someone’s call, to mobile communications…The question remains: are we going to allow a means of communications where it is simply not possible to do that? My answer to that question is: no, we must not. The first duty of government is to keep our country and our people safe,’’ he said after a speech in Nottingham, according to an article published in The Guardian. Cameron announced the bill would be put into law in the first year of his second term, should he be re-elected. In Canada, two terrorist attacks spurred the federal Conservative government to propose a new bill, the Anti-Terrorism Act or Bill C-51. In October 2014, a man drove into and killed one Canadian soldier, injuring another, at the Saint-Jean-sur-Richelieu army base before being gunned down by police officers. The perpetrator was already known to the police as a recent convert to radical Islam and a supporter of Islamic State. Two days later, another man killed a Canadian soldier on ceremonial duty in Ottawa while on his way to the Parliament of Canada. There he began a shooting spree only to be stopped by the Commons Sergeant-at-Arms, Kevin Vickers. The perpetrator was also known by authorities as an Islamic convert and for having mental health issues. Bill C-51 will give 17 law enforcement agencies broader powers to make arrests of terrorist suspects if the agencies believe a terrorist attack ‘‘may’’ occur. It will also expand the no-fly list and increase the period of preventive detention from three days to seven. The bill will also strengthen the Canadian Secret Intelligence Service’s (CSIS) power in that they will have an active role in disrupting suspected terrorists, as opposed to only gathering information. Finally, it will consider the ‘‘promotion of terrorism’’ illegal. However, the bill has been criticized by a wide array of Canadian citizens due to its content and language. Thus, environmental groups, indigenous people and unions, who often go up against the federal government, are afraid this new legislation might label them as terrorists. ‘‘The government wants to ensure that environmentalists and natives will not hinder the development of natural resources that put money in the pockets of multinational corporations, oil companies, etc. That’s their objective,’’ said Larry Rousseau, the Regional Executive Vice-President of the National Capital Region union. Moreover, both the national chief of the Assembly of First Nations, Perry Bellegarde, and the executive director of Greenpeace Canada, Joanna Kerr, expressed their concern that the bill may be used to silence legitimate dissent. Alex Neve is the secretary general for Amnesty International Canada. When interviewed on Global News’s Morning News, he echoed Mrs. Kerr’s apprehensions about the way the bill defines threats. The Harper government’s new bill was also the target of a joint statement from a group of prominent Canadians. The signatories include four former Prime Ministers of Canada, Paul Martin, Jean Chrétien, Joe Clark and John Turner, five former Canada Supreme Court justices and nine other experts directly involved in security affairs between 1968 and 2014. As of now, none of these signatories have been invited by the federal government to debate Bill C-51 at the House of Commons, the lower house of the Canadian legislative branch. But Ron Atkey, who formerly served both as an MP and as first Chairman of the Security Intelligence Review Committee, did speak at the House of Commons and brought up another controversial aspect of Bill C-51. The bill also sparked public protests in cities across Canada. On 14th March, thousands of demonstrators marched to denounce the bill in what was known as the National Day of Action or the ‘‘Defend our Freedom’’ national day. Federal opposition leader, Thomas Mulcair of the New Democratic Party (NDP), joined the protests in Montreal, Quebec. ‘‘C-51 is a bill that could seriously endanger our right to protest peacefully, to stand up against a government or an infrastructure or an economic policy,’’ said Mulcair at the rally. A poll conducted by Forum Research Inc. on 17th March on a random sampling of 1370 Canadian voters indicated that half of the respondents (50%) disapprove of Bill C-51, 38% approve of it and only 12% had no view on it. A Canadian federal election is due in October 2015 and many see Bill C-51 as the Conservative party’s polarizing showpiece to draw voters. The unveiling of the bill itself was in a more electoral context than a legislative one. 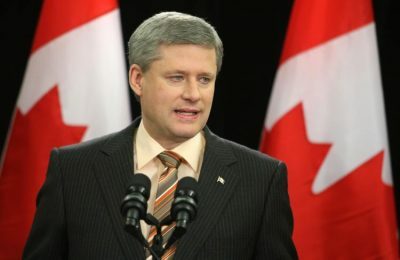 Prime Minister Stephen Harper proposed the new Anti-Terrorism Act at an event in Richmond Hill, Ontario community centre instead of the House of Commons where the legislative process usually takes place. In fact, Harper has not been present in the House of Commons while legislators there are debating the bill. Instead, he has been taking questions on the bill at public events. Meanwhile, Conservative Members of Parliament (MP) did not shy away from using rhetoric when discussing the bill. Even Federal Public Safety Minister Steven Blaney (Conservative MP for Lévis – Bellechasse, Quebec) was criticized for saying ‘‘the Holocaust did not begin in the gas chambers. It began with words’’ while defending one of Bill C-51’s proposal, namely making it illegal to promote terrorism online. Despite all the public criticism, the Conservative party’s alleged electoral strategy is working. With Bill C-51, the Harper government has effectively divided the Liberal party and the NDP, preventing them from presenting a united front. In fact, while the NDP rejects Bill C-51 in its entirety, the Liberals said they will support the bill, despite its ‘‘gaps.’’ Trudeau promised he will compromise during this Parliamentary session, but amend the bill to increase oversight if he wins the next election. Still, Mulcair repeatedly declared his openness to form a coalition government with the Liberal party in order to topple the Conservatives in the next election. Trudeau categorically rejects that notion. A poll by Forum Research Inc places the Liberals ahead in the electoral race with 36% of the votes, with Conservatives in second with 32% and the NDP in third with 21% as of 14 March.